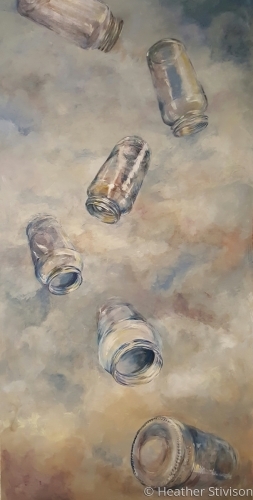 From the Empty Vessels Series: The theme of a number of my paintings is questioning what happens to things (especially bottles, jars, and shells) when they no longer serve their original purpose. I’ve been exploring their architectural forms and shapes and the way light plays on these objects. 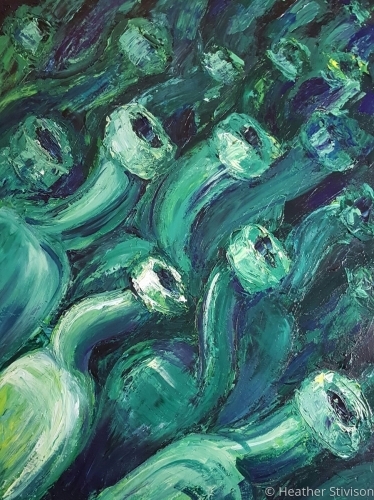 But here, in this 36″ painting, even the empty form has changed. Broken apart, it still manages to catch the light and my interest. 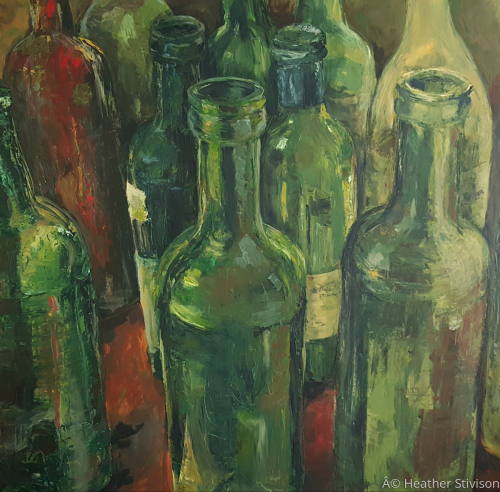 From the Empty Vessels Series: I ditched my paintbrushes and worked with a palette knife to create this oversized painting of empty wine bottles. It means I had to drink a lot of wine. The things we do for art! 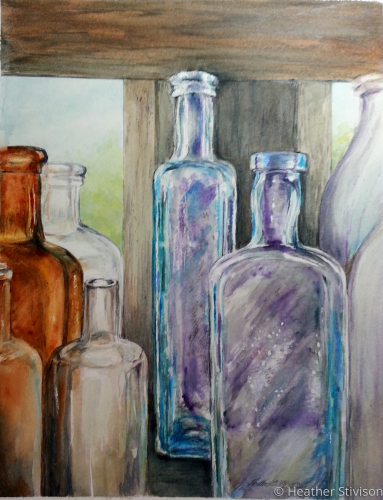 From the Empty Vessels Series: Wine bottles coming to life in a surreal dream. 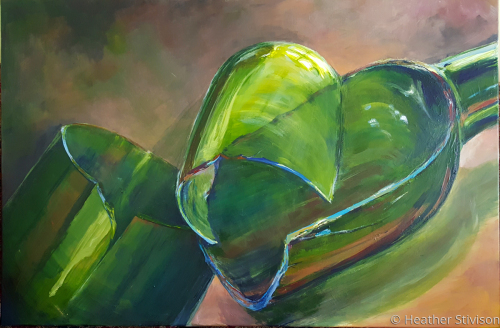 From the Empty Vessels Series: This painting developed from considering the way sunlight streams through empty bottles. 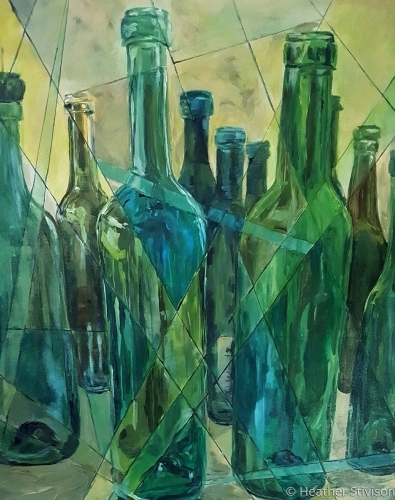 Though they are no longer needed for their original purpose of holding wine, they have become something new–things that capture the beauty of light. But they are fragile and can shatter into colorful shards in a moment of carelessness. From the Empty Vessels Series: My empty jar has taken on a new life. Is falling through space and about to shatter? Or is it swooping through space and turning to ascend once more? That’s up to you. 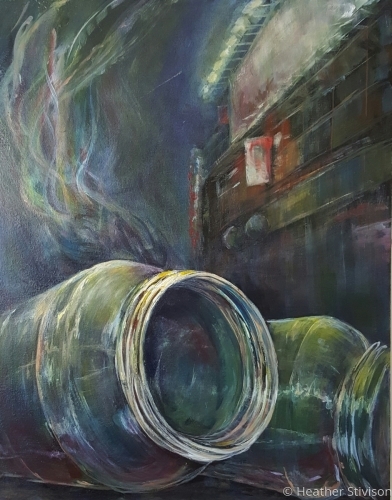 From the Empty Vessels Series: A surreal thought about empty vessels, no longer needed for their original purpose, taking on a new life in the city. After flying through the atmosphere in their last portrait, they have arrived in downtown Beijing.